/ TrustCoin: Financially Empowering the World But Is It Worth Investing In? With a name like TrustCoin, you can bet this is an ambitious cryptocurrency project. But what exactly is it and what does it plan to do? Here’s our deep dive into WeTrust and a full TrustCoin review. The first thing we want to point out before getting into the nitty gritty is that cryptocurrencies shouldn’t be viewed as money. Rather, they should be thought of as tools, or perhaps financial instruments. This is because the underlying blockchain technology has immense flexibility, determined by the programming of the particular project. It can act as a simple store of value and means of exchange, like Bitcoin, or as applications with as much variety as the mobile app stores of today. This versatility is partially the reason behind the explosion of coins on the market. Projects are dealing with goals as varied as democracy, charity, energy, cloud computing and content creation. Still, the primary use of cryptocurrencies remain in the financial industry. Trustcoin (TRST), created by WeTrust, is a coin that wishes to empower people without access to financial power across the world. Financial inclusion is their goal and it is something the world could very much do with. It utilizes the fundamental benefits of blockchain technology, such as decentralization, to put power squarely back into the hands of the individual. Banking services are still very much only accessible to the developed world. While developing nations are fortunate in that a section of their population are privileged with modern financial products and services, the more underdeveloped of these countries remain disconnected from all the conveniences of modern banking we take for granted. These sections of the population operate on very primitive methods of investment and saving, if at all. It can be difficult for them to obtain profitable and secure banking services when the nearest bank may be many kilometers away or when they are unable to meet unbudging KYC standards. This is the bridge that WeTrust wishes to build through its Trustcoin platform. The goal is to create a decentralized financial platform underpinned by global inclusion and transparency. It acts as a collaborative lending platform that makes saving and investment an accessible and consumer-friendly act. In the present world, less fortunate individuals from developing and third world countries save their earning by simply storing them at home or collaborating by pooling their money in a group. This latter technique is called a ROSCA, which we’ll talk about shortly. 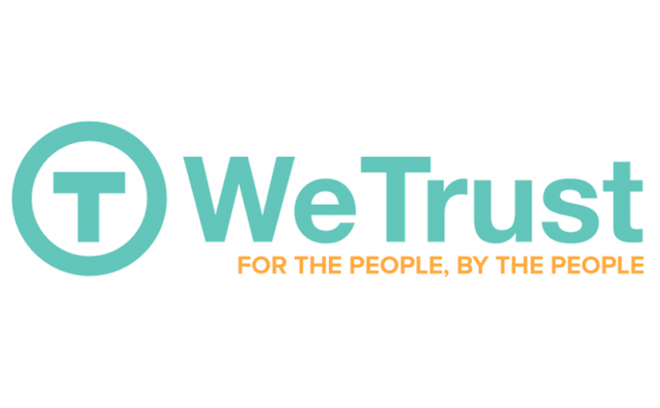 WeTrust functions on the Ethereum blockchain and will assist individuals and organizations in carrying out reciprocal aid. By letting users create decentralized applications, they hope to nurture an ecosystem where financial services benefiting customers can flourish and empower individuals from all across the world. Because smart contracts eliminate the need for intermediaries, the financial gains are held within the customer’s group – all the gains go to the customers. That eliminates the reliance on third parties that exists with modern banking as well as the current banking model which is built on providing profits to shareholders. Here is a statement of the power of this system: such a mechanism would have helped diminish the effects of the 2008 financial crisis. This crisis took place partially because the interest from insurance was disproportionately in favor of intermediaries. Now, TrustCoin is primarily a ROSCA platform. To understand the intentions better, you’ll have to know what ROSCAs are. ROSCAs, or Rotating Savings and Credit Associations, are a simple but effective way for a group to securely save and earn interest from their money. It is a popular method in underdeveloped countries, where more modern mechanisms of saving are simply not available. It goes by different names in different countries. ROSCAs work in the following way: a group of people gather together, with each individual contributing a certain amount of money into a pool. This is done monthly for a pre-defined period of time. Every month, one person in the group is allowed to collect entire pooled money. This can be done only once for each individual. The entire group can view the transactions involved, making it a transparent process. Moreover, since the contribution period is usually short, there isn’t too much concern for losing money, should someone collect money but not be able to pay his or her share. Now, here’s the problem: today, banks run ROSCAs. The problem is that they charge interest for facilitating this process. Not only does the interest pose a problem for consumers, but banks do not exist in many parts of the world, especially third world countries – places where ROSCAs are most needed. This deprives a large section of the world from being able to access self-financing and better the quality of their lives. ROSCAs have been most successful in empowering historically oppressed sections of the society, such as women. It is popular in areas with low literacy rates. With blockchain technology, WeTrust can now empower any and everybody through just a cellphone and an internet connection. How does the TrustCoin Platform Work? The TRST coin is going to marry this collaborative lending power of the ROSCAs with blockchain technology. They will do this through one of the decentralized applications they have developed, called Trusted Lending Circles. This functions exactly like a ROSCA, except the interest is kept between the participants and no third party is involved. Trusted Lending Circles is a dApp (decentralized application) that functions on the Trust token. The platform also accepts Ether. This is what the users will pay to keep the system functioning. The way the app works is as follows: A user who decides to create a Trusted Lending Circle will be deemed the “foreperson”. He or she will pay the initial amount. It is the responsibility of the foreperson to facilitate payments and ensure that other members in the circle pay their dues on time. When the members have been decided and join in on the group, the initial payment that each member has to make is offered. Once this is done, the first round of a bidding process begins, which works on the principle of a reverse auction. This means the lowest bidder wins the pot. For example, assume 5 individuals make the initial payment of 5 Ether, with the total being 25 Ether. Person 1 makes the lowest bid for the pot at 15 Ether. He or she receives this sum, with the remaining difference split equally between the entire group. At the end of this round, everyone receives some balance. Person 1 will no longer be able to bid. This happens over the entire cycle, with everyone receiving the pot at some point. Those who win later however, receive a slight interest on the amount and stand to gain more through patience. The interest that is accrued in this time period stays within the group. The platform itself levies a 0.3% operational fee. The foreperson will also receive a bonus for covering the losses that might occur when there is an individual who cannot pay. There is also another application in the works called CoinPool. The WeTrust platform does not distinguish itself in any way with its technology. Its unique use case is the primary way it sets itself apart from other coins. While it may be that it might reach a technical hurdle in the near future, it is possible for it to upgrade its blockchain when that time comes. You’ll have to keep a watch on the team’s development over the year. This will give one a good indication of whether the project is covering all bases and preparing itself for a future in which any users might get onto their platform. Easily the most significant driving factor towards the platform’s popularity is the power it could give the many unbanked people in the world. Developing countries are also a big market for this financial service. India, China, Mexico and Kenya are all countries that have a large ROSCA market. India alone possesses a $12 billion market, which could in fact be much larger. It is also realistic to see groups of individuals familiar with each cooperating to help themselves out of financial tight spots. This should be particularly popular with university students and young adults, two groups that often face shortages of money. The fact that the platform and process itself is very simple to operate is also in favor of adoption of the coin. The project is led by George Li, who is the CEO of WeTrust. He is a graduate of Stanford University and was also the co-founder of CottonBrew, Inc. His work experience includes working at Google as a Program Manager for Global Infrastructure. Patrick Long is the Chief Operations Officer and co-founder of WeTrust. He is a graduate of the University of California, Berkeley. His work experience includes Ernst and Young, and RMS. Tom Dimopoulos is the VP of Product. He is a graduate of Columbia University. He has worked at Brigade as the Director of Project Management. If the above credentials have caught your eye so far, Vitalik Buterin himself, the founder of Ethereum, is an advisor to the project. Other advisors include Bo Shen, founding partner of Fenbushi Capital and Brian Hoffman, founder of OpenBazaar. WeTrust’s TrustCoin is currently ranked 223 on Coinmarketcap, with a market cap of $68 million. Each token is valued at $0.73 at the time of writing this article. There is a total supply of 100 million TRST coins with roughly 92 million in circulation. TRST’s all time high value was $1.33, achieved in January 2018. At that time, the market cap was about $127 million. The coin can be expected to easily top that value in the coming months, though it is definitely going through a growing phase. There will be a lot of developments over 2018, which should bring some changes to its value. Personally, it would appear that this coin is one to bet on. However, as always, make decisions after thorough research. Anything could bring the value down and the cryptocurrency market has a tendency to turn on its head in a matter of hours. The outlook for this one is decent, but it is banking a lot on the hope that it will receive mass adoption. There is a lot of hope for what the project is doing. Cryptocurrency is all about the use cases – the practical benefits it has for society – and this project’s goals are as useful as any out there. There are billions of unbanked individuals in the world and pulling them into the economy not just benefits them, but the economy as well. This is a win-win for all involved and that should give this project some attractiveness to potential investors. The sound economic aspect aside, they are also providing reliable lending systems to friends and family circles. Almost every individual, and certainly young adults, go through periods in their lives when they are short on money. This platform will offer these adults a way to cooperate and work together to ease financial burden for all involved in the ROSCA. The trust rating system in place should incentivize donors to play nice and pay their dues on time. WeTrust has few competitors in this space. Their nearest rival, Wish Finance, has only recently launched an ICO, and has no decentralized applications ready, unlike WeTrust’s platform. It would seem like they have a good position here. This is definitely a coin to keep an eye out for, though it would not be a firm recommendation. It could very easily happen that some blockchain project appears that offers similar features on top of other features, or one that offers similar features but just much better. What WeTrust is doing is commendable. They are well and truly employing blockchain for a philanthropic purpose, something that a lot of blockchain projects cannot boast of. In fact, there are few that are staying true to the principal of Satoshi Nakamoto’s wish for democratization as WeTrust. Financial inclusion is necessary to reduce inequality in the world, an increasingly dire problem. That disparity can only be solved if everyone is treated the same in the economy. One way to create that opportunity is by letting people empower themselves financially. Blockchain lets people do that without third parties and WeTrust is paving the way.